Tracheostomy Tube - Cuffed • Inserted by way of a incision into the trachea. Tracheal tubes can be used either under anaesthesia or in normal circumstances for mechanical ventilation or for the administration of medication. Tracheostomy Tube - Uncuffed • Inserted by way of a incision into the trachea. Tracheal tubes can be used either under anaesthesia or in normal circumstances for mechanical ventilation or for the administration of medication. VersaTube® Tapered Tracheostomy Tube Intended to provide an artificial airway to establish airway patency and to provide maintenance of the airway. TRACHEOTOMY TUBE HOLDER This brace helps to keep the tracheostomy tube in place. One size-fits- all. Adjustable from both sides with hook and loop straps. 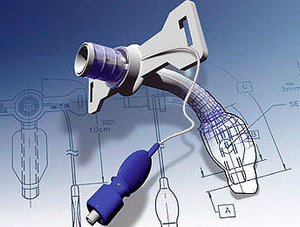 A tracheostomy tube is a device designed to keep the hole in the wind pipe open after a tracheotomy. A tracheotomy is a surgical procedure which involves opening a hole in the trachea at neck level to ensure breathing capability when the nose and mouth are blocked. The insertion of a tube ensures faster and more reliable delivery of air to the lungs. Some of these devices are adjustable and can be used with any patient. Others are designed for newborns or children. Certain models include a speaking valve. This enables the patient to talk by directing exhaled air over the vocal chords. Choice will depend on the patient's facial structure, the nature of the breathing problem and the length of time the tube will remain in place.